This recipe is more of a guideline than a recipe. It really depends on your personal taste. I’ve made many variations of this and have never been disappointed. 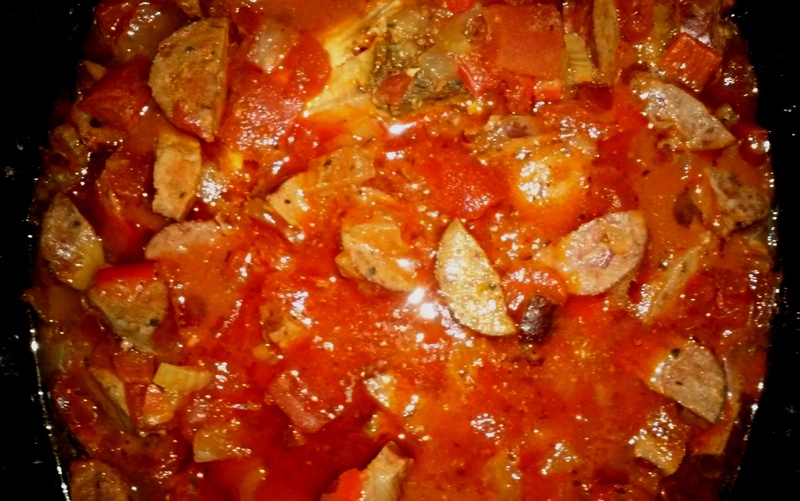 I do suggest using low salt or no salt tomatoes and broth because most Cajun spice blends contain salt and with the exception of the chicken, all the meats contain quite a bit of salt. Remember you can always add salt, it’s much harder to make something less salty. The meats listed are also just a suggestion. You don’t have to use them all, you can use any combination that sounds good to you. I have made it with and without chicken, with and without ham, with and without andouille sausage and have never been disappointed. *One last piece of advice, if you don’t like spicy food, start out with less of the Cajun seasoning and cayenne pepper. Let mixture cook awhile so the flavors can blend, and then taste the broth. If you want more spice add more Cajun spice and cayenne then. 1-2 chicken breasts, bone-in or boneless (I find that the texture of chicken holds better if you cook the pieces whole and wait to cut it up when the jambalaya is done). Put all ingredients into a crockpot and cook on high for 3 – 4 hours or on low for 7-8 or until vegetables are tender. Serve over rice.